We, the Top Kitchen Designs, offers kitchen fitting services in London for home remodeling. Our kitchen fitters will help you with an outstanding kitchen renovation service to give you the beautiful kitchen that you have always wanted. Feel at ease and have a piece of mind knowing that the best kitchen fitting services in London are handling your home kitchen interior design and renovation. – After making an online booking with us, our expert kitchen fitters London will visit you at your home and you will be discussing all the necessary aspects related to your kitchen renovation. You can also expect that you will be asked with a few important questions to further determine the most appropriate design that will not only be very beautiful but will also serve the main function of a kitchen. – Our kitchen fitters London will assist you with your design selection. You can even decide to have an L shaped kitchen as a replacement of your existing U shaped one. Which will then be followed with the floor plan creation which would include measurements and fitting and the a layout of what your kitchen will look like right after the remodeling project. This phase will allow you to have a better look and further decide if you want to have any changes. This will give you time to decide whether or not you will be having sufficient counter space and storage, no obstructions on other appliances, and will you still have enough space for additional appliances in the future. Once this is done, you will be assisted with creating an estimate for the kitchen renovation which would include the materials and all the other products needed for the home project. 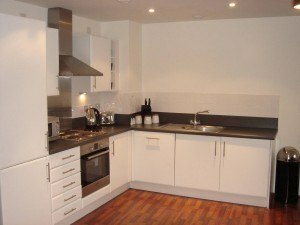 – We will take care of this crucial phase which is the kitchen installation London. This would include the removal of the existing appliances in the kitchen, wall remodeling, construction of the new plumbing system if needed, installation of new vents, lighting, putting in of new countertops and cabinets, hooking up of appliances and addition of flooring.